Describes how to set up Fedora Core 10 Linux on a Toshiba Satellite M35X-S114 notebook computer. 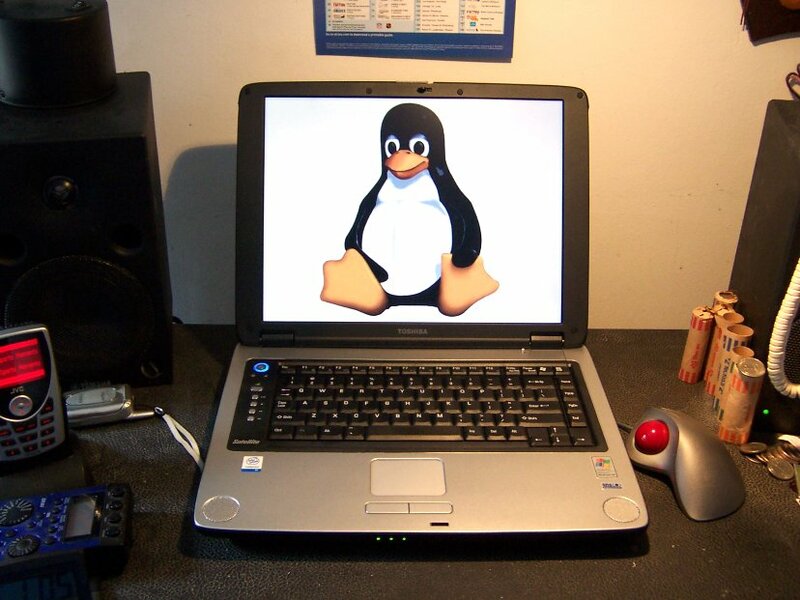 All of the internal hardware is currently supported under this Linux distribution, although some components require additional configuration or drivers. Toshiba's frequent offerings have often involved multiple extremely similar models and incremental (rather than revolutionary) changes from earlier models. As such, various parts of this document may apply to a wide variety of Toshiba models. I am providing this information to help others avoid the problems I encountered. The definitive source for Linux laptop information is the Linux on Laptops Page. This document assumes some minimal UNIX/LINUX knowledge. I provide no guarantees for any procedures stated in this document. If you're using an older distribution, you might find helpful info in my Fedora Core 2, Fedora Core 5 or Fedora Core 9 pages. You're more than welcome to e-mail me if you've got a problem, but I can't guarantee a prompt or helpful reply. Like many things in the Linux world...you're on your own. I would, however, appreciate any errata that you can point out so I don't mislead anyone else. This machine ships with 256MB of memory, of which 64MB is shared with the video chip. A memory upgrade will improve performance dramatically, especially with memory intensive applications like OpenOffice and Gimp. Memory can be purchased from numerous vendors online and comes on small SODIMM boards. In 2007, 256MB cost $30 and 1GB costs around $100. Although the machine can accept up to 2GB (two 1GB modules? ), for most folks, performance will be acceptable with a 256MB upgrade (for a total of 512MB) and pretty much optimal with a 1GB upgrade (1.2GB total). The open memory slot is located in a small, vented compartment on the bottom of the machine. As the pins go in, the package will want to move downward and the side clips will snap into place. Fedora is a free version of Red Hat Linux that is similar to Red Hat's commercial Linux releases, without the customer support or stability. I've been using Red Hat since v6.2 in 2000, although each release adds more unpleasant quirks that make it less suitable for laptops than for servers. If you have no specific reason to use Fedora, you might be better served by using Ubuntu which has a simpler and less-restrictive package management system. Fedora includes support for all the important hardware in this machine, so installation is fairly straightforward if you have some basic Linux knowledge. I am including my installation choices here for your reference. Burn a Fedora CD: Fedora is available from the Fedora Project website (and a number of mirror sites) as ISO image files that can be used to burn CDs. While Fedora is still available for the old-style installation as a complete multi-CD (or DVD) set, I chose to go with the single live CD install with the option to do network installs of additional software packages later over the Internet. Boot from the live CD: Insert the Fedora Live CD and reboot. While booting, press F12 to choose to boot from the CD-ROM/DVD Drive. The Live CD will take around 3 minutes to load. When given the login prompt, accept the "Automatic Login" default. Split your NTFS Partition: If this is a Windoze machine that you are planning on setting up for dual boot (where you can choose to boot up in Windoze or Linux), you will need to resize your NTFS Partition and free up disk space for installing Linux. Open a terminal (Applications -> System Tools -> Terminal) and run ntfsresize. If you don't need a Windoze side, it would be easiest to just blow away your Windoze partition and make it a Linux-only system. Start the Install: Double click the "Install to hard drive" icon on the desktop. You should get a splash screen - click next. Network Setup: Clich the checkbox so that both network devices are "enable on boot". Accept the manual hostname localhost.localdomain. Time Zone: Where you go, there you are. Unclick system clock uses UTC because Windoze prefers the clock use local time. This can be changed later, if you desire, in the /etc/sysconfig/clock file. Root Password: Choose something memorable, yet difficult to guess. Numbers, punctuation and mixed upper/lower case should all be used. Write this down somewhere safe 'cause it's pretty much impossible to recover a root password. Disk layout: If you are creating a dual-boot system or installing to upgrade an existing Linux installation, you should choose "create custom layout". This will bring up a graphical partition editor. Assuming you have two existing partitions after splitting your NTFS partition, you can delete /dev/hda2 and use the free space to create your Linux partitions. I chose to use partitioning from a previous installation and my partition table is as follows. The swap space sizing was recommended by the installer (around 2x my RAM of 512MB). I choose to use separate root and /home partitions (to permit easier recovery in the event of a disk problem) and do not use Logical Volumes (which are of value primarily to multi-user systems). When you've triple-checked that it is what you want, write partition table. Boot Loader: Accept the defaults, although if you have a Windoze partition on /dev/sda1, you may want to edit it and change the label to something meaningful or derogatory. Installer Runs: The installer will begin after the boot loader configuration with no additional warning - perhaps a reaction to the obsessive prompting of Microshit's Vista (tm). The installation takes five to ten minutes and will end with a screen indicating "Installation Complete"
Reboot: You should now shutdown the live Fedora version and reboot from the hard drive. On my shutdown, the screen went blank and the machine never powered off - strange. Holding down the power button for a few seconds forces the machine off, and then you can reboot. Firstboot: When you reboot, the Firstboot program will run with some additional user configuration and a bit of legalese. If you don't firstboot, you will need to add a regular username since it is a very poor security practice to spend alot of time as superuser. You may notice the system doing lots of disk and internet access at this point. Probably doing automatic updates!? 02:02.0 Ethernet controller: Atheros Communications Inc. It is supported by the ath5k module, which should install with the normal Fedora installation. makewhatis: If you ever use the whatis or man -k commands to search for a man page for a command, you should run makewhatis to build the database. Unneeded Services. To reduce boot time, improve system performance and enhance security, unneeded services should be turned off. Service startup scripts are located in /etc/init.d and linked in various /etc/rcX.d files. Links that start with an 'S' are enabled, links starting with 'K' are disabled. You can disable a service by changing the first letter of the link name to 'K'. Cron Scripts. A program called anacron runs system administration programs on a daily, weekly and monthly basis. Some of the default cron tasks are more appropriate to more complex systems and since some are quite disk intensive, they can cause unpleasantness if they start running in the middle of something critical. makewhatis.cron - keeps man -k references up to date. If you don't change software much, you can just run makewhatis -u manually if you add a man page. cups - only needed if you have a printer. mlocate.cron - updates the database for the locate command, which is unnecessary if you don't use locate. rpm - keeps a system list of installed RPM packages updated. Not necessary. smolt - hardware profiler (in /etc/cron.d) to a server somewhere? 0logwatch - monitors system logs and sends e-mail on system events. Good for server farms, unnecessary for simple single-user systems. vim - Live CDs usually only include vi, not the considerably more powerful vim command-line editor. Old-school, but small and reliable. libusb-devel - libraries and headers needed to use libusb, which provides direct userspace access to USB devices without having to write kernel modules. kernel-devel-2.6.27.5-117.fc10.i686.rpm - headers for kernel module compilation. There is a configuration bug where if you just install "kernel-devel", you will get kernel-devel-2.6.27.12-170.2.5.fc10.i686, which may be the wrong kernel version. You can do a uname -r to show the installed kernel version. Unofficial Packages: Red Hat, as a corporate entity, assiduously avoids supporting anything that even remotely has any DRM concerns that might awaken the M$-Beast. So Mplayer, MP3 support and some of the supporting libraries are not available from the trusty Red Hat repository. You may also want to consider commenting out the rpmfusion lines in /etc/yum.conf after you're done with the install so they aren't on your regular list of repositories to search for software. The first unofficial program you will need is MPlayer, the Swiss Army Knife of media players. While Flash video should work fine with X installed as it is, if you want to use this machine to watch DVDs or Windoze Media streams on the web, you will need mplayer. The other significant unofficial program you may want is lame, a program for creating MP3 files from .wav files. Flash Player: The Flash player doesn't come with the default install and my experience with Flash 10 (only current versions seem to be available from the Adobe Website was that it crashed alot and very unpredictably. If you can find a copy of Flash 9, that will probably work much better for you. Get the tar.gz version for Linux. Don't mess with the RPM or install script - just create the plugins directory and copy the flashplayer plugin library into it. Windoze Partition. If you left an NTFS partition on the drive at install time it is possible to mount the partition for read/write access with NTFS-3G. The RPM is available from the Fedora repository. PulseAudio: Fedora 8 started using PulseAudio, an audio server daemon that permits sharing and management of audio devices. It's integrated into the desktop but really it's just unnecessary overhead, especially if you do heavy sound work like multitrack audio. The X window server contains native support for TrueType (tm) fonts, although installing them via the command line is a bit more cumbersome than with an installer program or package. If you've got some on a Windoze box, TrueType fonts tend to look quite a bit better than the fonts that come with the distributions. And if you're doing any web development, you need them to have at least a guess as to what your pages look like on a Windoze box. It is possible to append a separate directory to the font path using xset, although the setting change is lost when you reboot your computer. The xset +fp command can be added to your .xinitrc file, although the simplest course of action is probably just to copy them to a subdirectory of the existing system font directory. As an old-school Unix guy, I've never found desktops to be the most comfortable way to work. I actually prefer typing commands rather than using the mouse to hunt and peck. Helps the carpal tunnel in my right hand as well. However, X Windows is still essential for graphical applications and useful for multiple terminal windows. Therefore, I use the very simple Motif Window Manager which is included with OpenMotif, an implementation of the ancient Motif widget set. The Motif Window Manager provides, as its name implies, window management capabilities. I use it by itself without the KDE or Gnome desktops. While you don't get a start menu or the ability to leave icons on your desktop, that way of working has always struck me as sloppy anyway. Use of only a window manager speeds boot time and reduces complexity. For some licensing reason, OpenMotif is no longer available in the Fedora repository. LessTif is available, but I have found its implementation of mwm a bit problematic (no alt-tab key to move between windows). So, you will need to download an RPM from the ICS FTP site.. You will also need the libXp. CD Burning under Linux has always been an adventure and is especially unreliable with the Matshita UJDA760 DVD/CD-RW drive in this machine. The situation got even more complex in 2006 when a group of Debian developers got in a dispute over the CDDL license that prickly developer Jörg Schilling chose for his cdrtools (cdrecord) package and decided to fork development at v2.01.01 into cdrkit (wodim). While the wodim command is aliased as cdrecord and maintains its general syntax, it provides less functionality and (with its roots in an older version of cdrtools) is more buggy. Fedora followed the Debian precedent and includes cdrkit rather than cdrtools. Even if a disk seems to burn and mount fine, I would suggest you always try doing a complete copy of the disk to make sure that all the data is actually readable from the disk. Sometimes an "input/output error" will occur while copying a bad file. Since I no longer have any need for dialup, I haven't made any effort to get the POTS interface working. Below are the instructions I used with Fedora Core 5. The internal modem built into this machine is a Winmodem, which is basically a cheap analog telephone interface with the actual modem signal processing provided in software drivers. The Intel 82801DB (ICH4) AC'97 Modem Controller (rev 03) (BCP\VEN_8086&DEV_24C6&SUBSYS_00011179&REV_03\3&61AAA01&0&FE) uses an Agere Systems codec SIL27 subsystem and is supported by the cumbersome slmodem driver, not the slick ltmodem driver. Start: As the name implies, the slmodemd uses a daemon that must be started before dialing. You must load the slamr kernel module before starting the daemon. You can include this in a script to simplify connection. symbolic link `/dev/ttySL0' -> `/dev/pts/2' created. As the message indicates, the modem device provided by the daemon is /dev/ttySL0. If you prefer a dialer with a GUI, kppp seems relatively popular and also uses the wvdial.conf file. Changing password for user jeff. You may get the message "BAD PASSWORD: it is based on a dictionary word" even though you use a strong password (mixed case, numbers, no words). Take it for what it's worth. A hand in the bush is better than two on your bird.